Close view of the Silver Nova stainless steel hand machined pickguard. 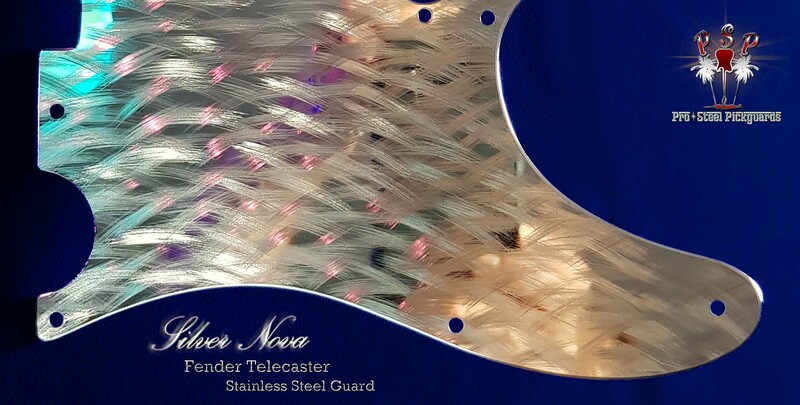 Silver Nova guard comes alive as the ambient light source changes direction, so does the Nova pattern shift reflections. A great example of how dynamic and lively a Stainless Steel guard can be. The surface is polished silky smooth, with the pickup slots and edges rolled and polished, as with all guards. * Silver Nova Silver Nova is also available in other Pickguards. Please contact us (top left) with your model and pickups layout. Tele - SS, SH, HH, SSS, Left, and many more. With or without matching Control Plate. Strat - SSS, HSS, HSH, HH, Left, Floyd. Covered or un-covered humbuckers.